All photos on this website are copyright The Love of China unless otherwise noted. 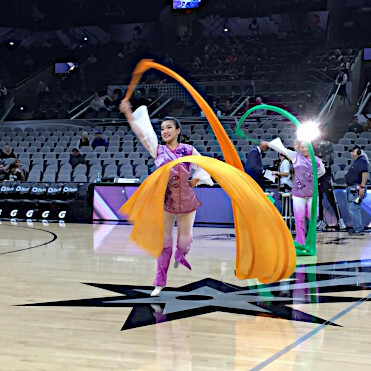 The Love of China School of Dance, located in northwest Austin, gives young people the rare opportunity of learning traditional Chinese dances, with students of ages spanning from four to eighteen. Our studio is located at 8650 Spicewood Springs Road #116 (Spicewood Springs Road at 183--see map.) Click here for full mailing address. 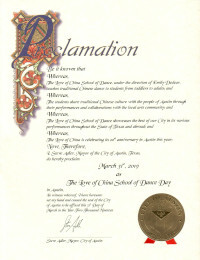 The school is well known in the Austin area and has performed at countless cultural events as well as its own recitals, always in front of packed theaters. The Love of China was honored by the Austin Police Department for their numerous community service performances. 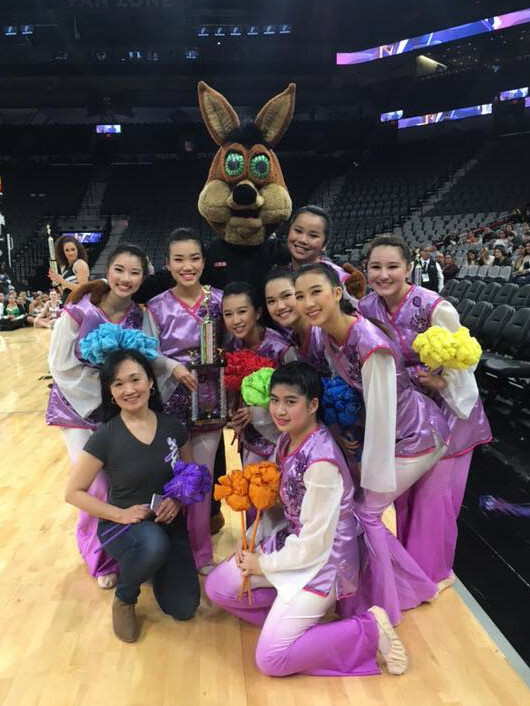 Also, the group has done shows with Splendid China, a nationally-renowned dance troupe from China, and has sponsored performances by a dance group from Taiwan. 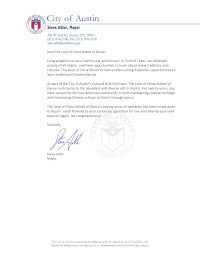 To serve the Chinese American community as an organization of maintaining the cultural heritage. To introduce Chinese culture to American society through dance performances. 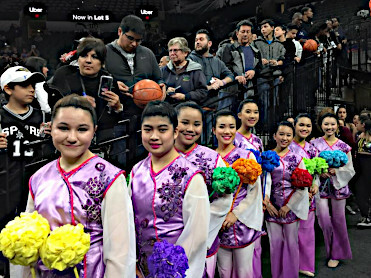 Through their education in Chinese folk dance, the young people grow in determination and confidence, and are given a chance to connect deeply with their heritage, be part of unforgettable experiences, and gain pride for their culture. 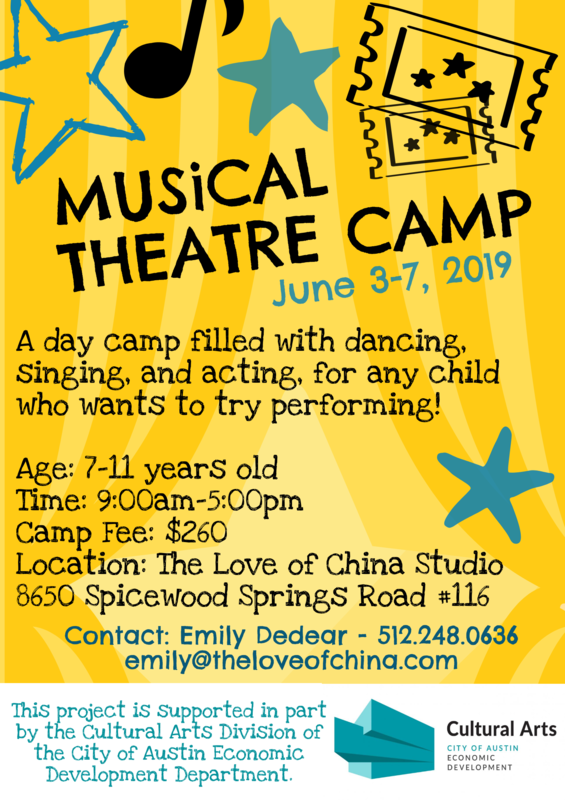 Emily Dedear began teaching Chinese dance in Austin in 1992, and officially founded The Love of China School of Chinese Dance in August of 1999. 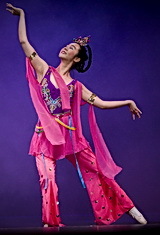 She grew up in Taiwan, where she trained in numerous different forms of dance, including traditional Chinese. 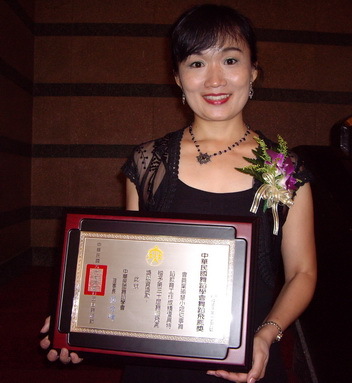 She is a graduate of Chinese Culture University in Taiwan as a dance major. She specializes in Chinese folk dance, Kung Fu for Chinese Opera, ballet and so on; she is also an expert at both stage performance and dance pedagogy. In 2008 she received the Flying Phoenix award from the National Dance Association of R.O.C. at a presentation in Taipei. You can meet our Teaching Assistants here! Some of our projects are supported in part by the Cultural Arts Division of the City of Austin Economic Development Department. We will have two summer camps for everyone who is looking for a GREAT summer camp program! NEW!! 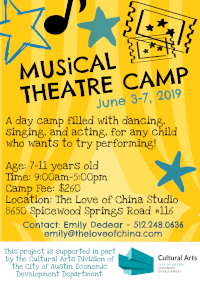 Musical Theatre Camp: A day camp filled with dancing, singing, and acting, for any child who wants to try performing! Main Teacher: Mia Dedear is an actor, violinist, dancer, and playwright. She trained as a theatre educator at ZACH Theatre, where she teaches musical theatre classes. 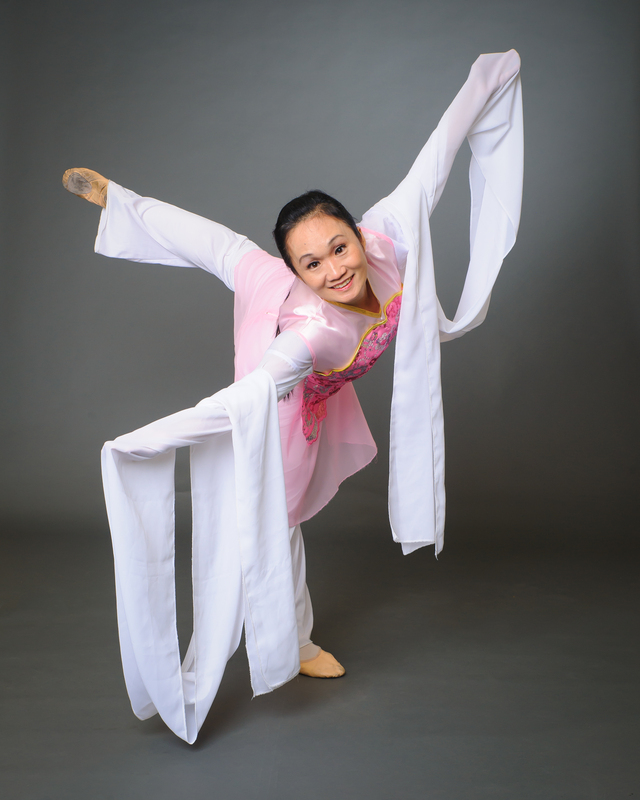 She has been a lifelong student at The Love Of China School of Dance, and now continues dance training at Ballet Austin’s Butler Center. She is a frequently working actor in both theatre and film, with training from the University of Texas Theatre Department and at HB Studios in New York City. 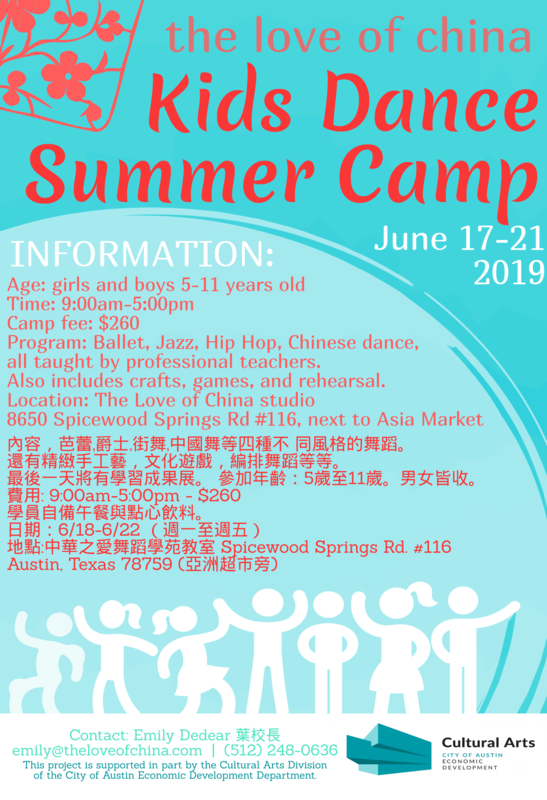 Program: Ballet, Jazz, Hip Hop, Chinese dance -- taught by professional teachers. Each day will feature a different style of dance. Friday will be the rehearsal day and showcase by the end of day. This camp also includes crafts, games, and small group rehearsals. 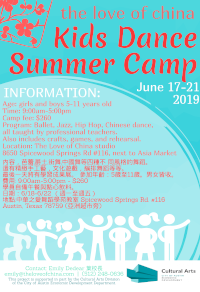 Both camps will be at our studio at 8650 Spicewood Springs Road #116, next to Asia Market. Contact us for more information. Mayor Adler commended The Love of China for twenty years of contribution to the abundant and diverse arts in Austin, saying that it has been a real asset to Austin. 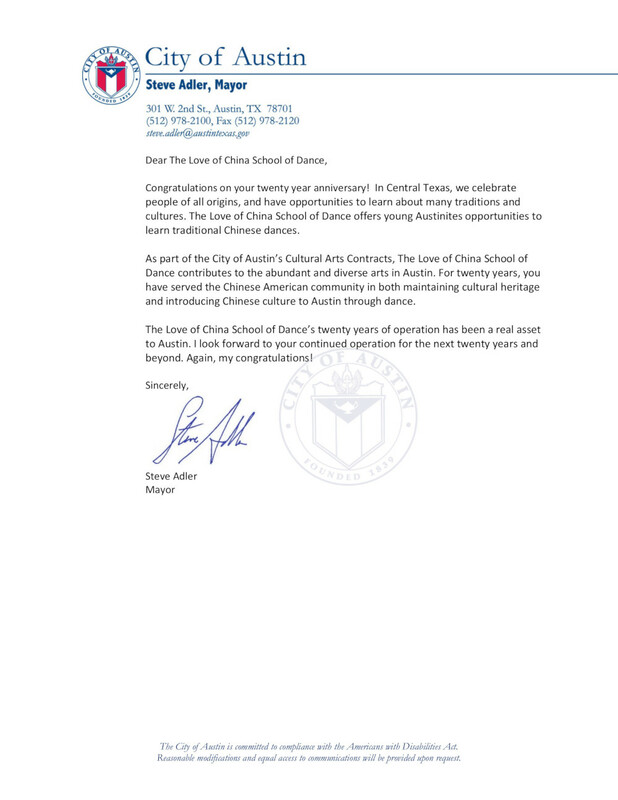 For twenty years, we have served the Chinese American community in both maintaining cultural heritage and introducing Chinese culture to Austin through dance. Click on the image of the letter to see a larger version. 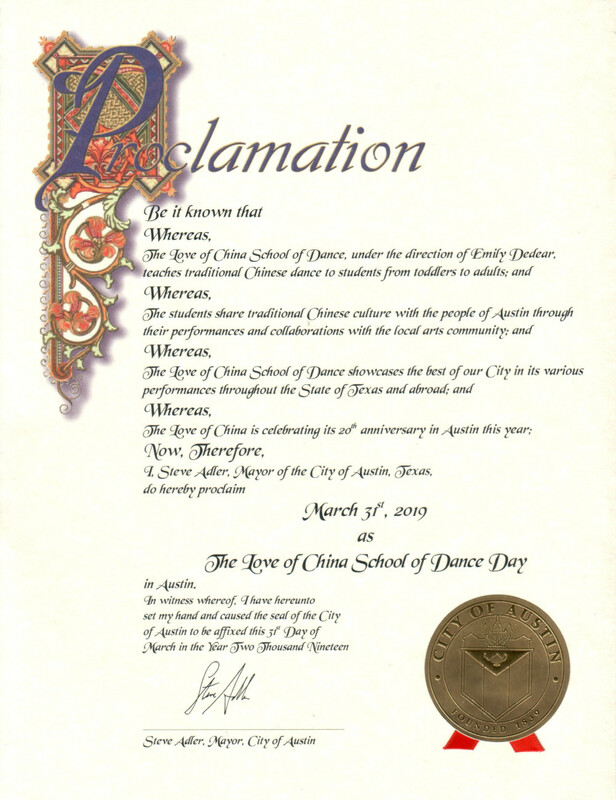 In honor of our 20th anniversary recital on March 31st, Austin's Mayor Steve Adler has proclaimed that day as "The Love of China Day". We will celebrate by performing our biggest program ever! Be there to celebrate with us, and bring your friends and family! Click on the image of the proclamation to see a larger version. If you are a professional dance teacher who is passionate about teaching any style, we are interested in talking with you. Though our primary focus is Chinese dance, we have also offered classes and workshops in hip hop, ballet, and ballroom dance. Contact us about how you might bring your own passion to The Love of China! The Love of China School of Dance competed in the Spurs Sports Academy Annual Dance, Drill & Pep Competition on Saturday, February 2, 2019 at the at the AT&T Center in San Antonio. Of 23 competing teams, The Love of China placed fourth, earning the right to perform at the opening of the San Antonio Spurs game that evening. Congratulations, Ribbon Dance girls! We have several performances coming up soon. For details, see our Performances page. Please contact us for more information. TLOC students performed at City Hall in Austin for the Asian-American Quality of Life Celebration & Volunteer Recognition event. 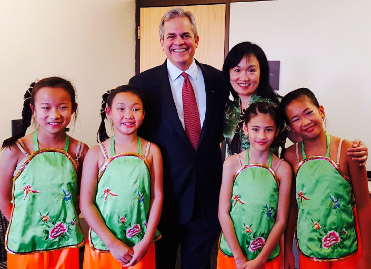 Here is our photo with Austin's Mayor Steve Adler. When not oterwise in use, our studio space is available for rent. Please contact us for more information. Our raised dance floor is designed with the proper degree of absorption and resilience. Specifically designed for dance, it is comprised primarily of foam, wood and air. The floor surfacing is a calendared vinyl consisting of a complex ‘sandwich' providing a slip resistant surface. This covering is used on the finest dance floors world wide. 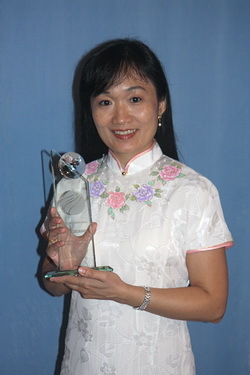 The Love of China's director, Emily Dedear, received one of three 2010 Community Leadership Awards presented by the Network of Asian American Organizations at its 2010 Induction Ceremony held on July 28th. Speakers at the event included Austin's Mayor, the Honorable Lee Leffingwell (who also received a 2010 Public Service Leadership Award at the event) and Former US Ambassador to the UN Sichan Siv.